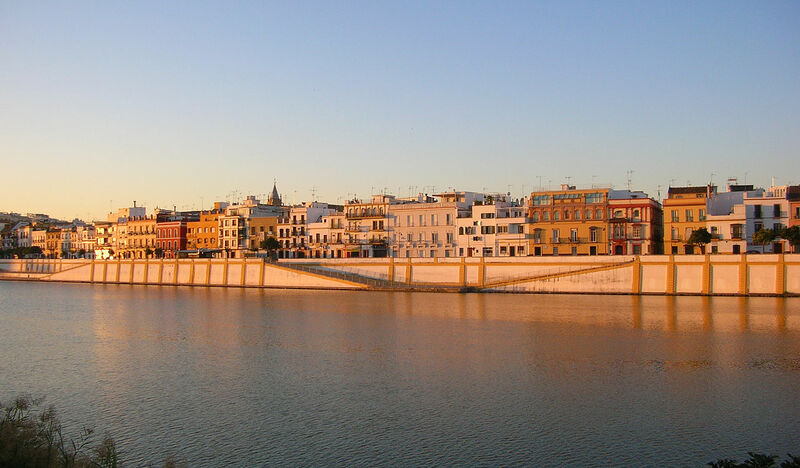 Triana has traditionally been a working class area, famous for its bull fighters and flamenco. Its paved streets and ceramic shops create a refreshing but authentic atmosphere. Visitors to Triana can buy traditional ceramics, walk through the town during the day and enjoy the lively atmosphere of the bars and the panoramic views from the other side of the Guadalquivir at night. The bridge of Isabel II, also known as the bridge of Triana, stretches to el Arenal and this iron bridge was constructed by Gustavo Steinacher and Fernando Bernadet in 1845. Calle Betis: The name of this street is not about the Football team. Is beacuse the ancient name of the Guadalquivir River. From this street you will be able to have a very good viewpoint of the city. Also is highlighted because its houses and the bars and nightlife. The fisherman’s chapel was built between between 1759 and 1815, in this chapel is located the image of the Stmo. Cristo de las Tres Caídas and Ntra. Sra. de la Esperanza de Triana. The chapel of Carmen, which stands at the end of the bridge, was built by Anibal Gonzalez in 1926. Calle Pelay and Correa: These white streets, adorned with flowers, evoke a genuine feel of Triana. Church of Santa Ana: This church was founded in the 8 century by Alfonso X The Wise and is the oldest Christian temple in Seville. It is the most famous parish in Triana. Calle Rodrigo de Triana: This street takes its name from Rodrigo de Triana, the Andalusian navigator who first spoke about the New World in 1492. Santa Justa y Rufina: The patrons of Seville were tile makers from Triana in the third century. It is said the Romans threw them to the lions because they refused to take part in a cult procession to the Goddess Venus. Plaza del Altozano: The houses in this plaza are at the most western point of the bridge of Isabel and are surrounded by hills. Ceramica Santa Ana: This is the most famous tile shop in Triana and was founded in 1870. It sells reproduction ceramic ashtrays from the 16 century. Kiosko de las Flores: This restaurant is well located next to the river and is famous for its fried fish.